Weapons of mass destruction are weapons of state. These weapons are aimed at cities inhabited by humans. For our joint human security, Article 9 provides the mechanisms we so sorely need to enable a society free from fear. How many people can associate the Article 9 of Japanese Constitution just with seeing the number “9”? 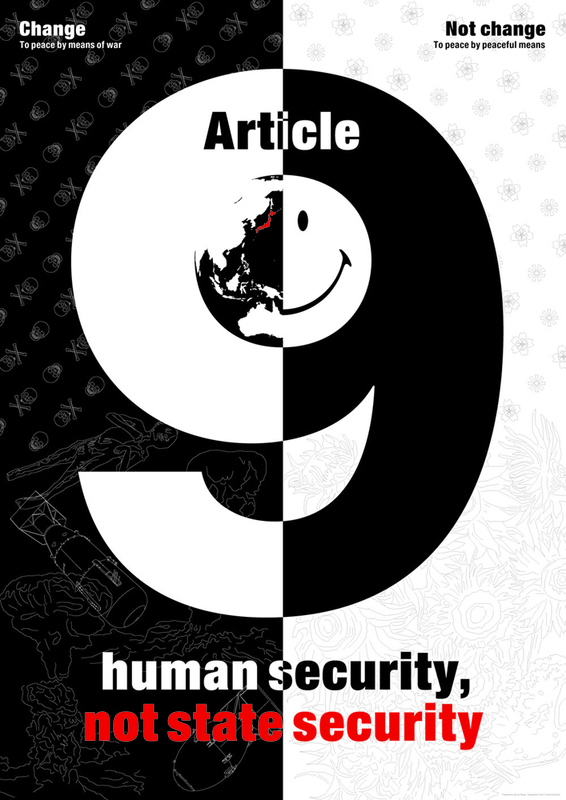 This poster provides vivid expression as if a number of “9” means our universal symbol of the Article 9. Message form Gunnar, who is from Norway, contains the view point which is other than Japanese. It is very strong. It has a big impression from a distance by the picture of poster and if we look it closer, it has also thought-provoking description. This message looks contrasting the two aspects: White and Black, Left and Right but the real message is more than that actually. This was a good opportunity for me to think about how international society considers the Article 9. Gunnar, thank you for giving me this valuable experience to work with you.